You’ve heard of an elevator pitch, right? It’s how you describe something to someone when you only have an elevator ride to make your case. Have you thought about your elevator pitch for Model UN? There are a variety of contexts in which an elevator pitch might be deployed — not just on an actual elevator. Maybe it’s a job interview, and you have your participation in Model UN highlighted on your resume. Maybe it’s around the Thanksgiving dinner table and your crazy uncle is trying to goad you into a political debate about the United Nations. Or perhaps you’re at a networking event and you make a connection with someone else who does Model UN or who is interested in international relations. What’s your favorite part about Model UN? What was the first country you represented? What’s the weirdest thing that’s ever happened in committee? Yes, but what are you going to do with that History/International Relations/International Studies/Political Science major? What’s Model UN about, anyway? Isn’t it just a bunch of nerds getting together and talking about putting weapons on the moon? What good is the UN? The Security Council just isn’t that effective and it’s expensive. Why is American participation in the UN important? Answering these questions provides an opportunity for you to apply the skills you hone and develop in the next few days. These questions allow you to be an ambassador — an ambassador for the Model UN community, an ambassador for engaged young people who are dedicated to learning about and improving the world we live in, and even an ambassador for the United Nations. In my current role, I spend a lot of time being an Ambassador: for AMUN, for Model UN and for the United Nations. But I want to let you in on a little secret. I was never a Representative at a Model UN conference. (I did do Model OAS . . . so I was not a total novice). I joined the AMUN staff in 1996. This is my 23rd conference and my 8th serving as the Executive Director. In those 23 years, I’ve done a lot of jobs here and learned a lot about Model UN, the United Nations, and the international community. When I think about what I’ve learned from being part of the Model UN community, a couple of memories really stick with me. I’ve learned that Model UN, at its heart, is really about the will of the body – it’s not about any single country or person or position. I learned this most clearly when I was a committee chair. The body was in the middle of intense negotiations on a resolution, and they were deeply divided. One of the caucusing blocs left the room to strategize and discuss their position, and while they were out, the other bloc saw an opportunity and they pounced—they made a motion for closure of debate on the resolution. The motion passed. The other group—the ones who were outside— realized what had happened, poured back into the room and requested a revote. I denied the request and prepared to move on. Then I saw the placard and took a motion to appeal the decision of the chair. My decision was overturned, we took a new vote, the motion failed and we continued debate on the resolution. It is a moment I think about often. They were not saying I was doing a bad job – it was about the will of the body. Even though you all will be on the other side of this interaction (for this year, at least), I urge you to think about what these kinds of moments have to teach us and what we learn from participating in the process. You have the opportunity to learn about other countries and the international system – to engage in perspective taking and to build empathy for people whose experiences are not your own. You’ve gained research skills—finding your country’s position on a variety of topics and triangulating information and filling in gaps with reasonable inferences and analysis. You have practiced preparing and delivering speeches to large groups and answering extemporaneous questions. You’ve engaged in negotiations—working with others to reach common ground while achieving the best possible outcomes for your delegation. 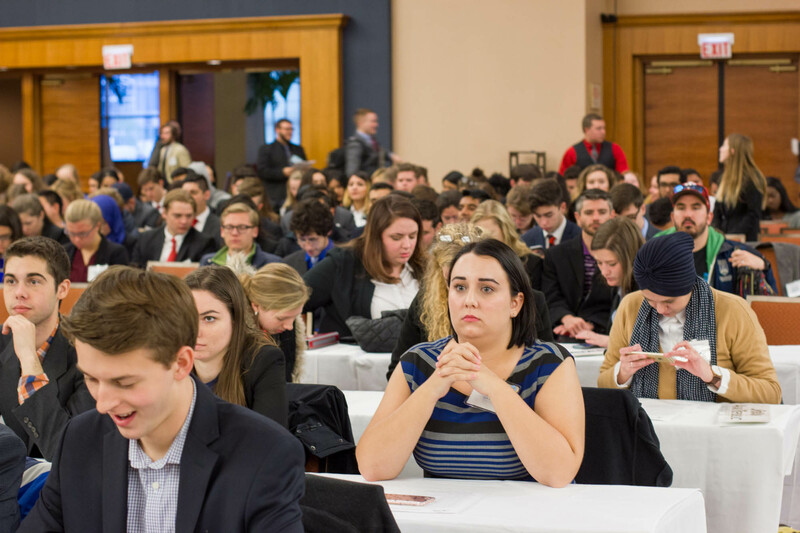 Model UN builds invaluable skills, but also teaches us a lot about the world we live in and about an organization that many people know very little about. The center of my elevator pitch is a lesson I’ve learned over and over again through my years doing Model UN: The world is an enormously complex place. The issues that the United Nations tackles are hard. There are often many competing viewpoints and ideas. But there is room to make progress. Over and over, we find common ground, often where we least expect it. Today, it may feel increasingly like the United Nations and multilateral engagement are under attack. Only 34% of Americans think the United Nations is doing a good job of solving global problems. And with the numerous global challenges around us, it is easy to see why: the Syrian civil war and subsequent refugee crisis rage on. The global response to climate change is faltering. Natural disasters caused more than $300 billion in economic losses last year. When people ask me or, in fact, challenge me about the relevance of the United Nations, I acknowledge these problems. They are real. Don’t pretend they are not. Smallpox has been eradicated from the world. And the United Nations continues to supply 45% of the world’s vaccines. The hole in the ozone layer has been healed after significant depletion. More than 80 million malnourished people receive food aid. We have common, global standards for use of the radio spectrum. More than 100,000 peacekeepers prevented escalations of 14 major conflicts this year. And, a benefit that many of us experienced in the last 24 hours, we have a global system for civilian air traffic control, enabling safe flight and transit around the world. Despite all this good work, the critics are partially right. The United Nations today cannot solve the crisis in Syria or prevent escalating climate change. The problems are too hard—the resources needed are too great. But all of these problems will take global cooperation to solve. States cannot solve these problems alone—they NEED a forum to come together and talk. We have to work together, and ultimately we need a stronger United Nations, not a weaker one. So here’s my challenge to you over the next four days: What’s your UN elevator pitch?